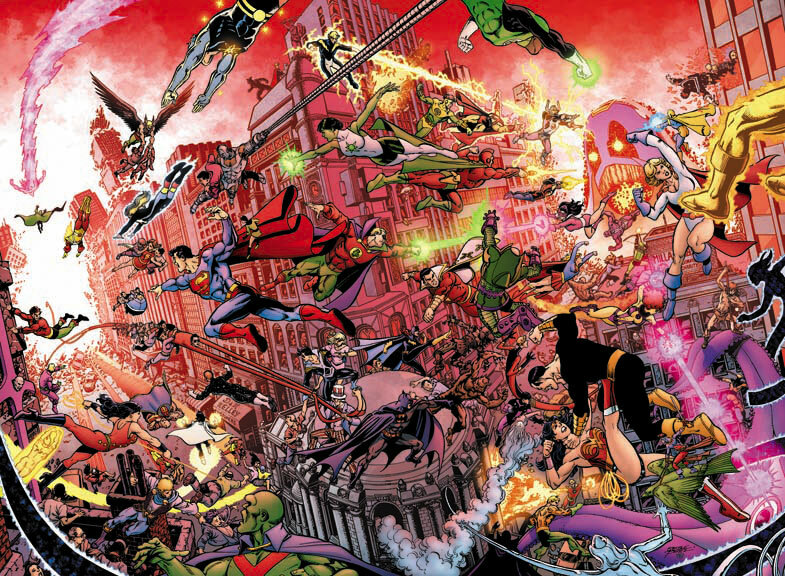 Just about a year ago, DC Comics launched DC UNIVERSE LEGACIES, a ten-issue maxiseries written by Len Wein and drawn by a variety of artists, meant, ostensibly, to catalog DC's "now-in-use" narrative history. It didn't really work out that way, mainly because DC's history is such that no one will ever be able to make complete sense out of it, and I think they acknowledged that in the story. DC UNIVERSE LEGACIES #5 and 6. Art by George Perez. Thanks to Supergirl Comic Box Commentary. The real reason to buy the comic, though, was the art, because with the exception of the final issue, Len Wein wrote scripts for the most apt and appropriate artists to draw that particular era of DC's history. We're talking Andy and Joe Kubert for the Golden Age in issue 1, evoking Joe's own particular style from when he drew in the 1940s; Jose Luis Garcia-Lopez (who else?) for the Silver Age; George Perez to illustrate (what else?) the CRISIS ; and so on. And then there were the "Snapshots," short 8- or 9-page backups at the end of each issue, written by Len Wein and drawn by a different artist each time, showcasing the more obscure or less used characters in DC's massive catalog, and me being who I am, I jumped at this. I love shorter stories, and one of the reasons I'm sick of big events is the lack of shorter stories we now get. So what I'm going to do here is I'm going to rank, in order, the DCU LEGACIES Snapshots, from my least favorite to my favorite. Enjoy! The Story: A teenage Clark Kent is working in his farm one day, and then members of the Legion of Superheroes from the 31st Century come out to induct him into their superclub. Before they can do so, another set of Legionnaires from even further in the future comes by to say why they can't do that. Then another set of Legionnaries show up. Hilarity ensues. 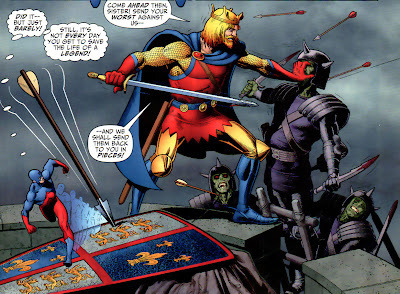 Why It's Number 10: Keith Giffen is a good artist, and when it comes to comedy, he's always been one of the best. But this story falls short. 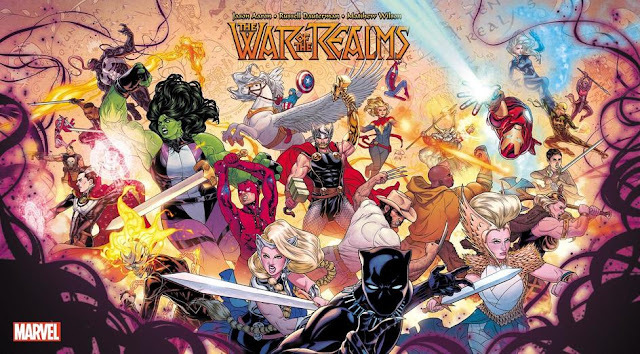 The story essentially pokes fun at DC's long and convoluted history, particularly that of the Legion of Superheroes, but for the new readers — who are presumably the target audience for this book — the story ends up looking defensive about the confusing nature of the characters. New readers should feel the sense of wonder rather than read the inside jokes that they're not in on yet. 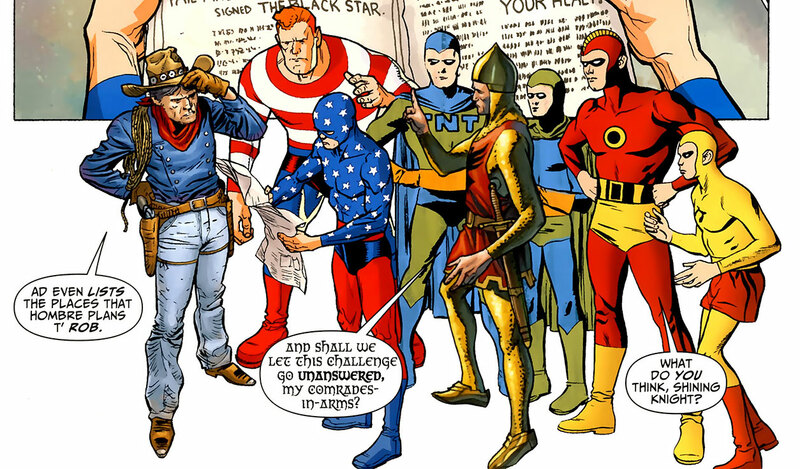 THE STORY: Adam Strange, Captain Comet, Tommy Tomorrow, and the Space Ranger, the premiere spacefaring heroes of their respective generations, get caught in a massive intergalactic game of war, perpetrated by the space pirate, Kanjar Ro. Why It's Number 9: Maybe it's just that I'm not particularly fond of DC's space heroes, maybe it's because I'm really not fond of Adam Strange, who seems to be the subject of a mandatory appearance rule whenever any superhero is in space, or maybe I'm just not a big fan of Walt Simonson's art (and I just finished reading the first volume of his THOR VISIONARIES , so I've seen him at his peak), but this story just didn't click with me. 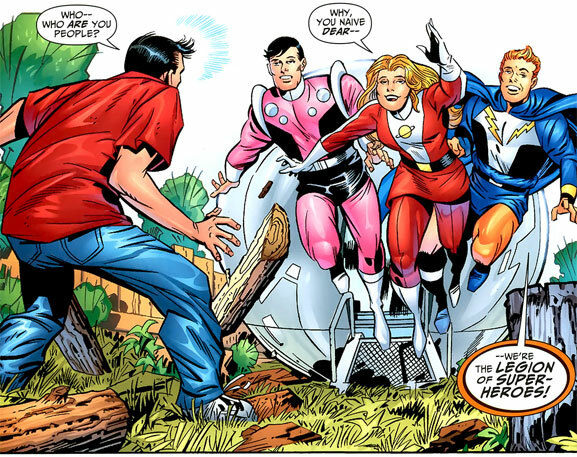 It didn't help that Adam Strange took on the role of protagonist (he gets the beginning and the end) when everyone's just important in the crux of the story. Of all the Snapshots, this one feels the most rushed. Thankfully, my numbers 9 and 10 came at the two issues when George Perez was on art duties in the main story (pencils for issue 5, inks for issue 6), so it mattered less. Why It's Number 8: I am so, so torn on this one, because Bill Sienkiewicz is one of the greatest experimental artists of all time, and it should be a treat to see him do anything he's never done before. 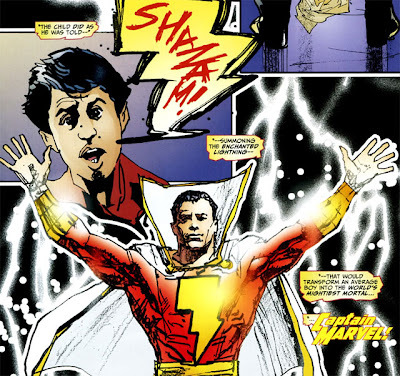 But at the end of the day, as I've explained many times, Captain Marvel has a whimsical, fantastical nature, and in that sense, I've never seen a bigger mismatch than putting Bill Sienkewicz on him. It also leaves a bit of a bad taste in my mouth, because it's even more indication that DC doesn't really care about what makes the character work. They're just going to continue to use their "dark," "more realistic" version of Captain Marvel, no matter how unbelievably unsuccessful it has always been, and always will be. The Story: This is essentially a retelling of the first few issues of Jack Kirby's NEW GODS from the point of view of one of the civilians in the story. Why It's Number 7: Following Kirby is always a tough act to follow, and Wein and Quitely do it fine here. 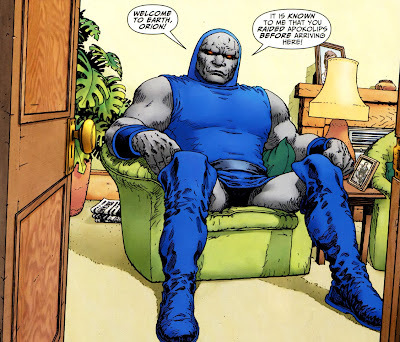 My opinion of Quitely is the same as my opinion of his usual partner Grant Morrison: great when he's good, horrible when he's bad, and smack-dab average most of the time. Quitely's smack-dab average here, though it's entirely possible that I would be more generous if I didn't recently read JACK KIRBY'S FOURTH WORLD OMNIBUS . 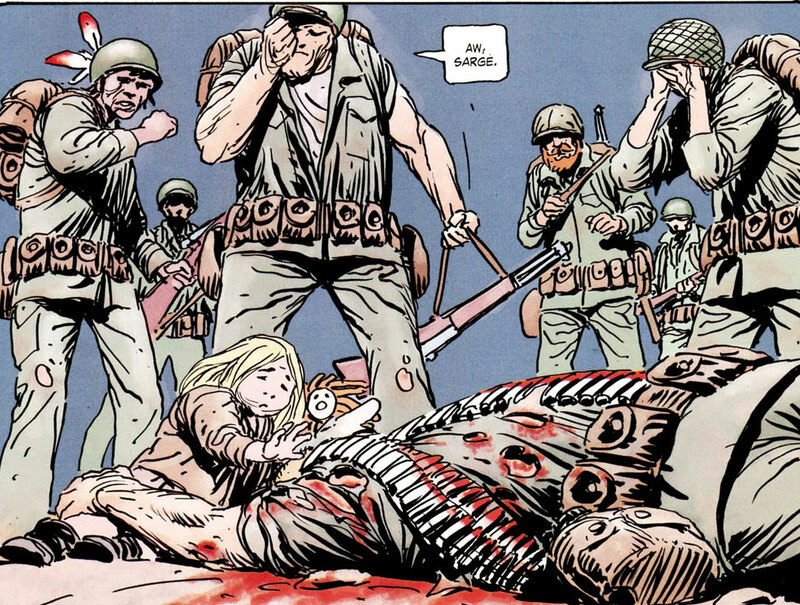 Plus, I have to give Wein and Quitely demerits for removing Brola's hand of stone. The Story: The Challengers of the Unknown and the Sea Devils team up to fight a big volcanic monster! Why It's Number 6: Ah, now this is more like it. This is exactly the kind of straightforward short story that I would have loved as a young, new reader, offering just enough characterization about these heroes that you most likely have never heard of to really make you realize just how large the DC Universe really is. Great story. The only faults it has is that it's done by Dave Gibbons, who seems to have lost major steps since his glory days of the 80s. Gone are the technical lines that Gibbons used to command with absolute precision. More and more, he's becoming "just" a really clear storyteller. More artists today could still learn from him, but his art just isn't the same as it used to be. The Story: Basically a first-person retelling of Ted Kord's superheroic career, this follows the Blue Beetle from his introduction to the first Blue Beetle to moments before his death. Why It's Number 5: I just don't see why it had to be this story. That's all. 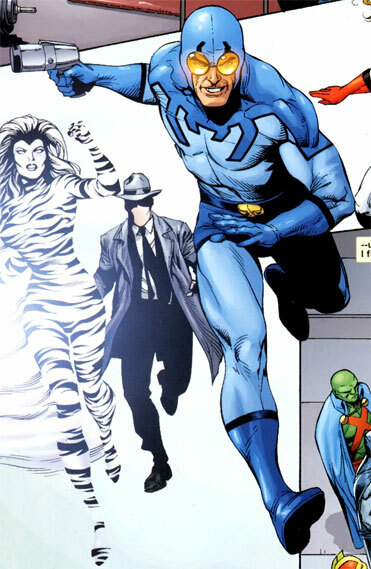 I know there are those 200 Ted Kord fans that are really pissed that he died and that 100 of those fans are pissed that he hasn't been brought back yet, but I really don't see the point of rehashing his entire history, only to end moments before his death. Newer readers would feel this is a cliffhanger (and this was the last Snapshot, so they'd feel it even more), and older readers just saw this story five years ago. Having said that, it's a good character study of Ted Kord, and the art by Gary Frank is out of the park. Gary Frank is one of the absolute best artists working in comics today, and he may be the best artist in comics today when it comes to drawing the human figure. Seeing him draw the Blue Beetle, Captain Marvel, Batman, and others is a gigantic treat. The Story: Investigative reporter Scoop Scanlon, a Golden Age character who first appeared in ACTION COMICS #1, the first comic that featured Superman, investigates a crime scene where mystical superheroes Dr. Fate and the Spectre were involved. Why It's Number 4: This surprises even me, because I really hated Jones' work in FINAL CRISIS , but after reading this, I've decided that he's just not good at big epic stories. He is, however, great at the short ones. Scoop Scanlon's skepticism about the nature of mystical beings such as Dr. 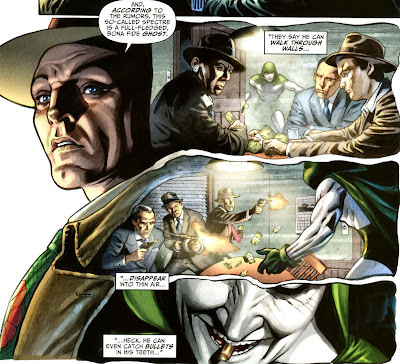 Fate and the Spectre is shown in his body language and facial expressions, and I really like the techniques that Jones pulled in this story, such as putting speech balloon tails on the flashback panels, connecting it to Scoop's mouth, to emphasize that he's the one narrating the flashback. Very well-done. The Story: The Golden Age Seven Soldiers of Victory — in order from the left, Vigilante, Stripesy, the Star-Spangled Kid, TNT, Shining Knight, Dyna-Mite, the Crimson Avenger, and Wing (who wasn't an official member) — split up to fight five different crimes! Why It's Number 3: I know we all expect me to put the JH Williams III work to top this list, but not in this case. That's how good the other two are. Williams goes all-out as he always does on this Snapshot, drawing each member of the Seven Soldiers in different styles (a trademark of his), coming up with different logos for each hero, as if they were appearing in their own titles, and capping it off with a very inventive page layout that revolves around the number 7. Artistically, this Snapshot is genius, but narratively, it feels very rushed and not given much time to develop. Which isn't a problem for our next one. The Story: On July 4, 1976, DC's war heroes, including members of Easy Company, Madamoiselle Marie, Bill Storm of the Losers, and Jeb Stuart of the Haunted Tank meet for America's Bicentennial. They relive the last days of the war, when Sgt. Rock (DC's primary war hero) died, and pay tribute to their country. Why It's Number 2: It's a little weird for me to put something so patriotic to a country that's not my own this high, but it's really just that good. It's a complete story, not rushed at all, and the sincerity that emanates from each character and the actual emotion that comes from it is very powerful. 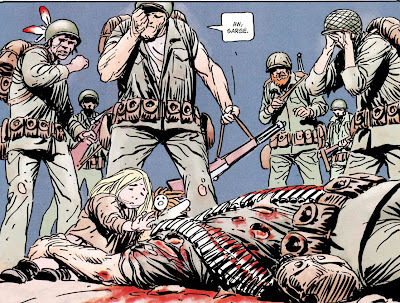 There's a reason Joe Kubert runs a school for people who want to work in the industry, folks. Seriously. 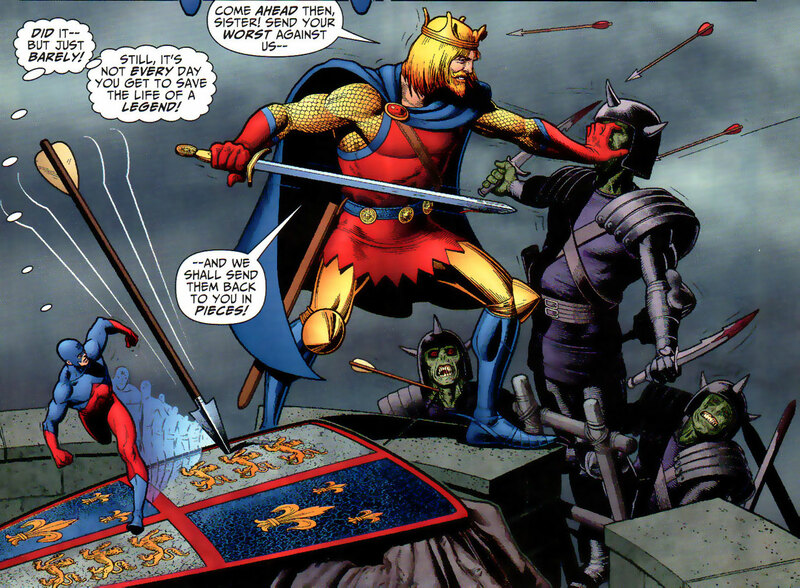 The Story: The Atom goes back in time to the Middle Ages to see the Shining Knight, the Silent Knight, Merlin, Etrigan the Demon, and King Arthur! Why It's Number 1: Brian Bolland hasn't lost any of the skill that made him a premiere penciler in the 80s. He's still as good as ever. What has changed, though, is his level of output. Independently wealthy, Bolland has never had the need to draw interiors for comics, nor has he drawn anything over two pages for any other writer since Alan Moore and THE KILLING JOKE . So when you see this story, kicked off by intricate designs in the first panel and then carried by the technical precision that Bolland has always had and still has, and then you take into account that he's just drawing characters from random times when Atom goes on his time trip, like Enemy Ace, Arion, Jonah Hex, and the Black Pirate, and finally add the fact that BRIAN BOLLAND IS DRAWING KING ARTHUR AGAIN, just like he did in CAMELOT 3000, the first-ever direct market comic maxiseries, and it's hard not to give this comic the top spot. I think that "Snapshot: Remembrance!" might have been a better story, but the narrative lead it has is not enough to compensate for the other rather large lead this story has over all the others in the list. That's my ranking, folks! Agree? Disagree? Let me know! In the meantime, the DC UNIVERSE LEGACIES hardcover is available!